This mat is best suited for short uses while in socks or barefeet. The shape is definitely that of a butterfly in both the outline of the mat, the fidget points, and the surface. 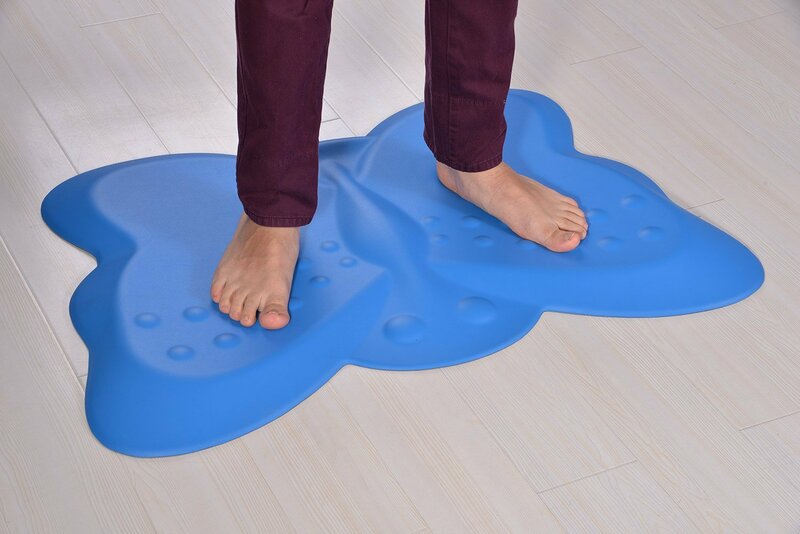 You will enjoy using this mat for short periods of time since there are plenty of places to put your feet each with a different feel. For long term use however this mat is tiring. 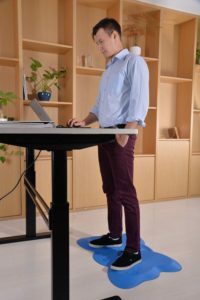 You may also find that you cannot get it close enough to your work to have a flat surface for your feet to stay on. 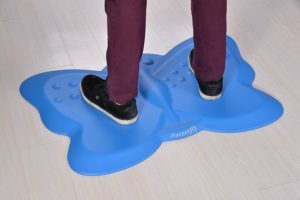 The Butterfly Mat comes in three color’s purple, baby blue, and black. I was able to use and review the black version and it is definitely black. Like all mats it collects a little bit of dirt from your slippers and feet as you use it and from time to time you will want to wipe it down with a damp paper towel or cloth to keep it looking good. The shape of the mat surface varies a lot. There is the middle ridge which is very soft. There is the area just to each side of the middle ridge which is quite hard. Then the softness varies all throughout the design due to the changing thickness and the additional “massage points”. One challenge I had while using this mat is that the surface is slanted toward the middle ridge. Using the mat all day my ankles were quite tired of holding me since they were tilted out slightly. This is the primary reason I do not recommend this mat for all day use. I do recommend that you experiment with turning the mat sideways and backwards while you use it. Each position has a different feel and will provide a different level of cushion for you. People looking for a mat to use at the office should note that this mat is best when you remove your shoes, much like a kitchen mat.